Back on the bus once more .... And off to Üchisar. 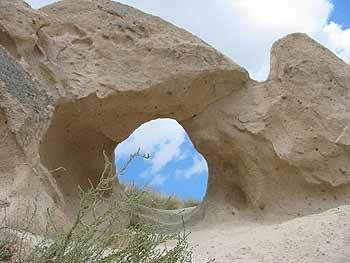 The largest rocky outcrop in the area, Üchisar is known as the castle and is peppered with holes from ancient dwellings. We took a walk to the top of it in the midday heat, which was a real test of our leg muscles. As we climbed, the call to prayer sounded out with two mosques very close to each other seemingly competing with other. Competing for the title of 'man most sounding like a strangled cat' I think, and they were both trying their best, I am pleased to report. The view from the top of Üchisar is well worth the walk, but given that we'd already been up some height earlier in the morning in the balloons, it couldn't really compete. We then got back on the bus once more and moved on to the next carved out dwellings. 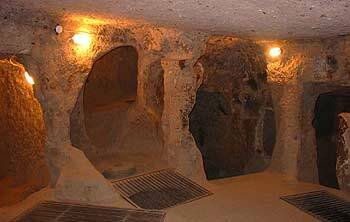 This time, however, they were not simply carved out of a rock face, but rather carved out from under ground. 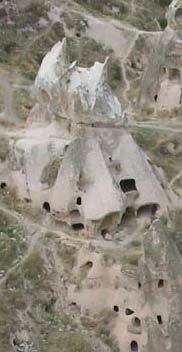 Kaymaklı is one of a number of underground cities in Cappadocia. It goes to a depth of some 80 metres although visitors are restricted to the first 30 metres, which is roughly 4 stories of eight. This is one visit that is most definitely not for the claustrophobic. Many of the tunnels required squeezing in and stooping down somewhat, and it was like a maze down there. If there were a power cut it would be a very scary experience, particularly given the extra added fun of random pot-holes which are only just about covered up by loosely secured gratings. It really is one of the great mysteries of history - how on earth did people find the time or inclination to dig so much out from the rock, and so far down (and remember, it all had to be carried up to the surface - tonnes of the stuff), without the luxury of modern excavation equipment. However, I can imagine that the people who did live here felt very secure behind their stone doors. I also imagine that they were all about three foot tall or walked with a severe stoop. So, we'd had a hectic day already, and Neil asked who would like to go on an optional walk through Rose Valley. Surprisingly, despite people's tiredness, a number of us decided to do the two-hour walk, during which we stopped for a picnic lunch. View from the top of Üchisar Castle.